District and school websites are no longer just electronic bulletin boards. If all you wanted was a district or school website, you could get it from any number of providers. But you want more than a website. You want a communications hub that can help you connect with your K-12 community the way you need to every day—one that will help you meet the demands of today's technology-savvy staff, parents, and students. And, you want your brand and reputation—and the public's perception of both—to be positive. 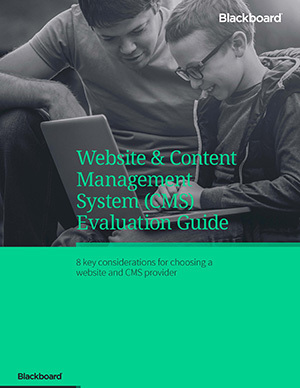 Our website and content management system (CMS) evaluation guide provides eight key considerations to help you choose the right platform for your district and schools. The result? You'll be on your way to making an informed decision and closer to connecting with your K-12 community. Download your copy to discover the critical things you must consider and the right questions to ask as you evaluate website and CMS providers.